PM Narendra Modi has left for Astana, where he will attend the two-day SCO meet. New Delhi: Prime Minister Narendra Modi held bilateral talks with Nursultan Nazarbayev, the President of Kazakhstan after reaching Astana today. 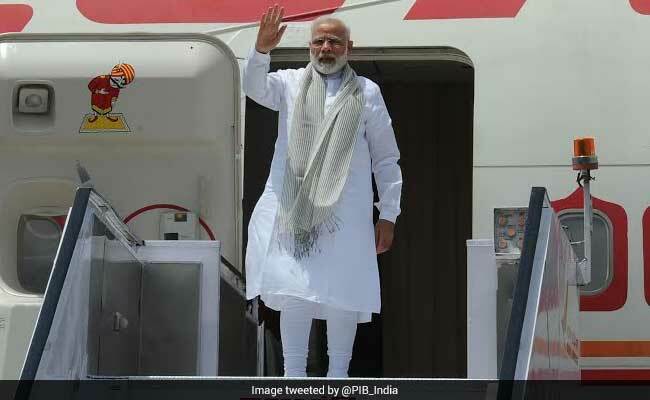 PM Modi is in the Kazakh capital to attend the two-day summit of Shanghai Cooperation Organisation or SCO - a consortium that focuses on security and trade. India and Pakistan - will be formally inducted in the six-nation bloc that includes China, Kazakhstan, Kyrgyzstan, Russia, Tajikistan, and Uzbekistan. So far, both nations have observer status. On the sidelines of the summit, PM Modi is expected to have a bilateral meet with Chinese President Xi Jinping. But no bilateral with Pakistan Prime Minister Nawaz Sharif is expected. PM Modi met the Kazakh President soon after his arrival. "Mr. Nursultan Nazarbayev, President of the Republic of Kazakhstan, met PM @narendramodi and discussed ways to expand bilateral ties," the Prime Minister's Office tweeted. The resource-rich grouping of the Shanghai Cooperation Organisation collaborates on trade, economy, connectivity, energy, transport and banking. After SCO membership, both India and Pakistan are expected to follow Tashkent-based Regional Anti-Terrorism Structure and join the other member nations to conduct military exercise. India was formally invited to join the group last week by Russian President Vladimir Putin during PM Modi's visit to St Petersburg. Becoming a full member of the SCO will help India establish better trade and economic ties with member countries. It will also strengthen India's strategic position in Central Asia. Tomorrow, PM Modi and China's President Xi Jinping are expected to meet on the sidelines of summit. The meeting is expected to ease the strain the ties between two nations have com e lately over issues like the One Belt, One Road or OBOR project and China's opposition to India's membership in the exclusive nuclear club NSG. Foreign minister Sushma Swaraj, however, has ruled out any bilateral meeting between PM Modi and Nawaz Sharief on the sidelines of the SCO. "No meeting is scheduled either from their side or from our side," she had said on Monday. Ms Swaraj said India has made it clear that it wants to hold dialogue, resolve all issues bilaterally without mediation from any third country, organisation or anyone else. "But at the same time, terror and talks cannot go together," she said.